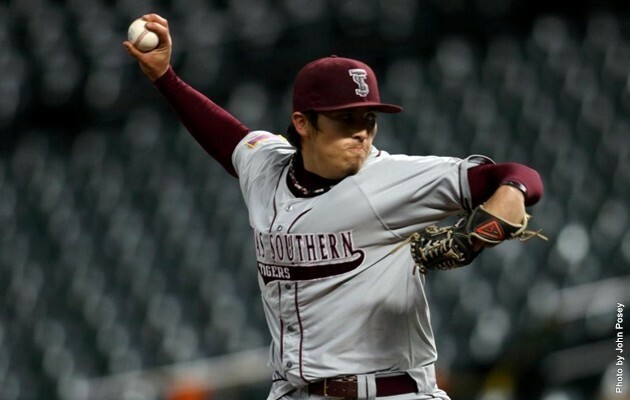 HOUSTON, TX – Andrew Garza had the big stick for the Tigers when they faced Prairie View A&M on national TV in the MLB Urban Invitation at Minute Maid Park. TSU beat Prairie View 9-0 in a game that was carried on the MLB Network. Sebastian Stargell, Jr. got the Tigers’ offense started in the 2nd inning when he led off with a triple to left center field. Garza finished it up with a double down the third base line to drive in TSU’s first score of the night. De’Mario Thibodeaux gave Texas Southern their second run when he singled to left field and Ellis Stephney crossed the plate. The Tigers’ big inning came in the 5th. Garza picked up two RBIs when his double up the middle sent Thibodeaux and Corbin Smith home. Stargell scored on the same plate on the throw. TSU held a 6-0 lead at this point. Stephney tripled in the 7th inning and scored on the throw to give the Tigers a 7-0 lead. TSU scored two runs in the 9th inning and wrapped up their second win of the tournament. Garza ended the game with 2 hits and 3 RBIs. Marquis Curry and Smith also had two hits each. Robert Pearson was outstanding on the mound. He pitched 7.1 innings with 6 strikeouts, two walks and no earned runs. The Tigers are 2-0 in the MLB Urban Invitational with one game left to play. TSU will face Alabama State on Sunday at noon for their final game of the tournament.